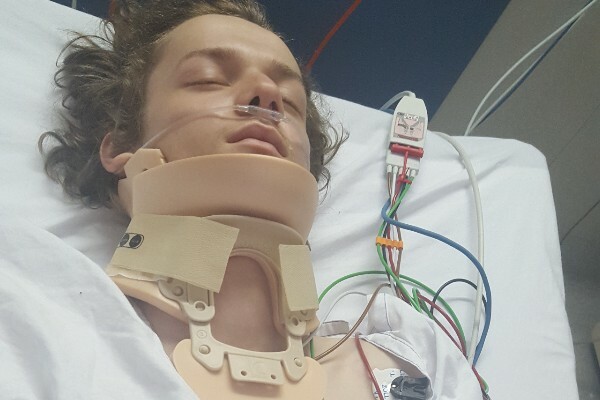 21 year old pizza delivery boy Alex has had to put his life on hold as he recovers from an accident which was no fault of his own. 4WD - slicing it into two. With no income and months of recovery and rehab. He is worried how his rent and other bills will be paid. Workers compensation, insurance and other avenues can take a long time to come through. It would be nice if 'everything' was covered but unfortunately it usually isn't. There will be other expenses such as family members taking time off work, extra Physio, travel expenses, modification to cars and homes as well as legal fees (which you may get back if you 'win' but not always and you will probably need a deposit to get started) he will have ongoing expenses for the rest of his life, please don't jump to conclusions and start questioning the motives here. If he was at work, surely he is covered by workers compensation? Guys, don't even go there - the poor kid doesn't want to go on workers comp. That means he'll loose his job. Stop being insensitive and maybe help the kid out. Even though I wholeheartedly approve of these go fund me pages, if the accident was this severe, surely somebody witnessed it and can identify the 4wd?? Also, he should be covered by his employers insurance too. It seems that this poor lad is being scammed big time, and unless there is some reason that either of these two things are not an option, then I don't understand why he isn't covered. Not to sound insensitive, but surely he would be covered under workers compensarion. Get well soon Alex. Love from Phil and Clodagh in Manchester.